by Seton Motley, Contributing Author: Government is an organism just like any other. Just like any other, its first priority is self-preservation. Its second is self-expansion. They are like the Francisco Pizaros of our wallets – the enticement and excitement of pillaging virgin territory is almost unbearable. Instead of putting the same bill to the Senate, however, Reid has decided to attach it to a proposed law called the Marketplace Fairness Act (MFA). That bill, which first passed the Senate last year, would require online retailers to collect tax on sales they make to out-of-state consumers.How much will MFA cost us? At least $13 billion – just in new taxes. For now. 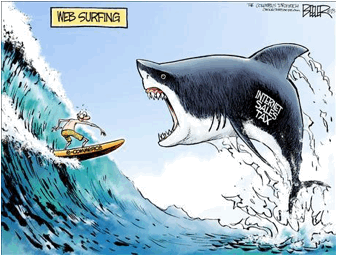 So FCC Chairman Wheeler is contemplating a Hail Mary – Title II Internet Reclassification. Which is a huge new regulatory monstrosity. And…surprise:Under Title II, President Obama can also begin to tax the Internet –just as the Feds tax landlines, just as they already tax the living daylight out of your wireless (cell phone) Internet.These new taxes would be hay-yuge. …(O)nce ‘internet access services’are reclassified as ‘interstate telecommunications services’under the exclusive authority of FCC, it will be subjected to the 16.1% fee that’s currently applicable to such services. So FCC’s ‘net neutrality’could result into the largest single tax increase on internet to date.And that huge tax rate goes up every quarter – automatically. Now you know why your phone bill taxes are so absurd. Census: State, Local Government Tax Collection Hits All-Time HighMeanwhile, governments’ spending increases inexorably. Federal, state and local governments are just this year spending $6.3 trillion. The entire U.S. economy is $17.4 trillion. Tags: reclassification, Net Neutrality, Internet tax, web tax, big government, Seton Motley, Less Government To share or post to your site, click on "Post Link". Please mention / link to the ARRA News Service. and "Like" Facebook Page - Thanks! The internet is a free speech networking system that should not, I repeat NOT BE TAXED!!! PITFA = Popular. MITFA = Mess. Dirty deeds in the Senate halting legislation that is important to American freedoms granted to citizens and business to force (arguably unconstitutional) tax collection requirements through a poorly considered/written bill (MFA) rampant with complicated and vague requirements for which small business owners cannot safely traverse. I strongly recommend eMainStreet's website and their Youtube video channel on the subject.